ISLAMABAD, Jan 3 (APP): Ambassador of Pakistan to France Moin ul Haque has said that people-to-people contacts will improve as Pakistan and France work for strengthening their cooperation in the areas of culture, sports and education. 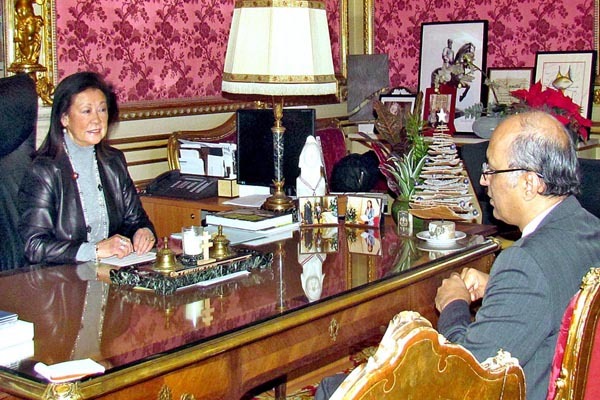 According to a press release received here Tuesday from Paris, the ambassador in a meeting with Mayor of Paris-8, Ms. Hauteserre in Paris, emphasized that greater understanding and respect for each other could be achieved through increased contacts between scholars, artists, researchers and exchange of students and cultural troupes. He apprised the mayor of various events which have been planned by the Embassy to introduce Pakistan’s rich social, cultural, historical and archaeological heritage to the French people. Conveying Christmas and New Year greetings to the Mayor and the people of France on behalf of the people of Pakistan, the ambassador expressed the hope that year 2017 would witness intensification of relations between Pakistan and France. While acknowledging the importance of people-to-people contacts, the Mayor of Paris-8 extended her full cooperation to the Embassy of Pakistan in its efforts to introduce Pakistan’s social and cultural heritage to the people of France. Paris. The major touristic attractions such as Champs-Elysees, the Arc of Triomphe, the Place of the Concorde, Elysee Palace and as well as Embassy of Pakistan are located in Paris-8.